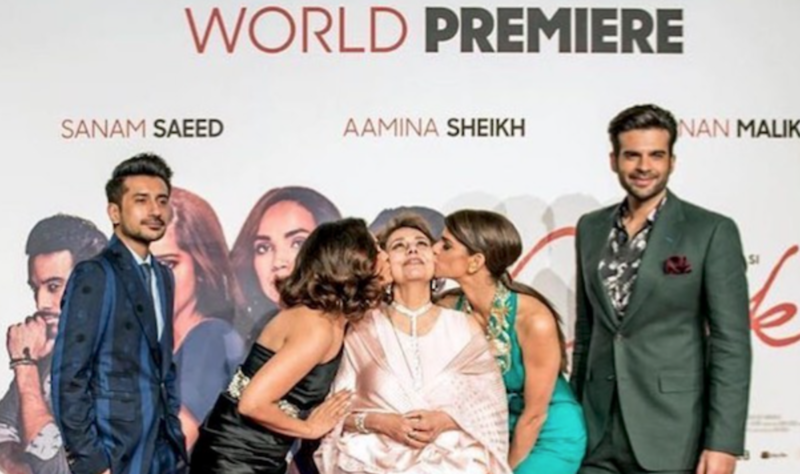 London’s West End yesterday played host to the stars of one of the most anticipated Pakistani film releases of 2018, Cake, as the Red Carpet was laid for the film’s World Premiere at Vue West End. Actors Aamina Sheikh, Sanam Saeed, Adnan Malik and Beo Raana Zafar; director Asim Abbasi; and producer Sayed Zulfikar Bukhari were joined by a who’s who guest list of celebrities and VIPs for the milestone occasion that marked the first ever World Premiere of a Pakistani film to be held in London’s iconic home for international film premieres, Leicester Square. Additional guests in attendance included actors Mahira Khan, Art Malik, Roxanne Pallett and Ainy Jaffri; music artists Naughty Boy and Juggy D; TV presenter Melanie Sykes; co-owner and Vice Chairman of English football club QPR, Amit Bhatia, British businessman Peter Virdee, cricketer Monty Panesar; Baroness Warsi MP; and UK’s first Muslim to go to space and poet, Hussain Manawer. Guests dazzled on the Red Carpet ahead of the World Premiere screening. Cake, a co-production between UK and Pakistan, has been generating worldwide buzz since the teaser launch and UK fans and audiences are now preparing to welcomes the stars, who are embarking on a UK-wide tour of public appearances ahead of the film’s theatrical release on 29th March 2018. A truly crossover Pakistani film, Cake is a family drama about love, loss, choices and responsibilities. The story unravels when the ageing patriarch of the Jamali family is taken ill and his eldest daughter and sole caregiver, Zareen, is forced to reconnect with her sister, Zara, on her return from London. Cake is set to release in cinemas on 29th March 2018.